When the Steamboat Institute's Jennifer Schubert-Akin, who had been running in the Boston Marathon since 1995, crossed the finish line that terrible day in April 2013, she anticipated a happy reunion with her husband Rick, whom she could see standing in front of a Walgreens near the finish line as she ran by. Then she heard something unexpected. "When the second bomb exploded," she recalls, "my first thought was that he was going to be walking right through whatever was happening. I fished my phone out from the bottom of my bag and had to turn it on and had to wait for my phone to boot up, which seemed like an eternity, and then I got him. Once I was able to determine that he was alright, we met back at the hotel room and then turned on the TV. The reports started coming in. Rick was close enough that he has partial hearing loss from the explosions." As a result of the bombing, Schubert-Akin did two things: she emerged even more determined to run in subsequent Boston Marathons, and she cemented a friendship with Rebekah Gregory, who suffered the amputation of her left leg because of injuries sustained in the bombing. Gregory wrote an inspirational book “Taking My Life Back: My Story of Faith, Determination and Surviving the Boston Marathon Bombing." Gregory has spoken at the Steamboat Institute's Freedom Conference. "What marathon and ultramarathon races instill in you is that you have to be relentless," she says. "I have been on both the failing side and the finishing side, so I can say honestly I know what works and what doesn’t. But you have to have relentless focus and you have to be very well prepared. Running an organization like The Steamboat Institute is much the same way because it's difficult. It’s a challenge. But it’s a worthy challenge." Schubert-Akin finished the 2017 Boston Marathon, her twenty-third consecutive one, in great pain because of a tibial plateau fracture in her left leg and a stress fracture in her right leg, both sustained during the latter half of the race. Following recovery from surgery, she completed her twenty-fourth consecutive Boston Marathon in 2018, and will be running in her twenty-fifth on April 15. "What marathon and ultramarathon races instill in you, as you train for them and participate in them, is that you have to be relentless," she says. "I have been on both the failing side and the finishing side, so I can say honestly I know what works and what doesn’t. But you have to have relentless focus and you have to be very well prepared. And you just have to have a lot of grit because at some point you're going to want to quit. You’re going to hurt really, really badly, and everything in you is telling you to quit. But you have to keep going. Running an organization like The Steamboat Institute is much the same way because it's difficult. It’s a challenge. But it’s a worthy challenge." When Schubert-Akin co-founded the Steamboat Institute, with husband Rick, she aimed high: why not have an Aspen Institute for conservatives? The Aspen Institute attracts statesmen, presidents and world famous intellectuals to its prestigious seminars and conferences. Schubert-Akin had heard radio host Laura Ingraham remark that she had just returned from being the "token conservative" at an Aspen Institute Ideas Festival. Schubert-Akin, then Republican Party county chairman for Routt County in Colorado, already had been thinking about the need to better prepare candidates to absorb and compellingly express conservative principles. She had also just been through a training program run by a nonprofit group called The Leadership Program of the Rockies[Unknown A1]. "It trains participants in the founding principles of this country and gives them great access to speakers, including the country's leading conservative thought and policy people. I already had had this idea for a conservative speaker program and it occurred to me that it could be a conservative alternative to the Aspen Institute." When Schubert-Akin co-founded the Steamboat Institute, with husband Rick, she aimed high: why not have an Aspen Institute for conservatives? The Aspen Institute attracts statesmen, presidents and world famous intellectuals. Schubert-Akin had heard radio host Laura Ingraham remark that she had just returned from being the "token conservative" at an Aspen Institute Ideas Festival. These three factors converged, and Jennifer and Rick,along with a small group of concerned citizens--all of whom had full-time careers--co-founded the Steamboat Institute, headquartered in Steamboat Springs, Colorado, an internationally recognized ski resort, in 2008. Jennifer and Rick are Oklahoma natives who met at the University of Oklahoma and lived in Austin, Texas, before moving to scenic Steamboat Springs. Jennifer was CFO of a large health and human services organization in Austin. Rick isan attorney and founder of The Akin Law Firm. 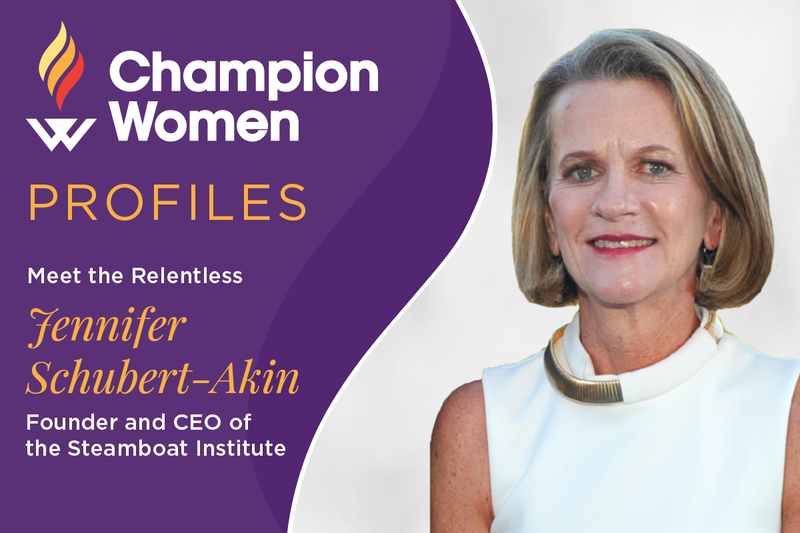 After five years of serving as volunteer CEO, while running her small business consulting practice in Steamboat Springs, Jennifer became full-time Chairman and CEO of the Steamboat Institute in 2014. The scenic location is no accident. "Steamboat Springs is a very special setting because of the beautiful Rocky Mountains," she says. "Since it is a ski resort town, there are many similarities to Aspen in that regard. And it was a place where, we discovered, people love coming in the summer, the speakers and the guests, who come from all over the country." "The Steamboat Institute promotes America's first principles and inspires active involvement in the defense of liberty," its website states. It does this "through hosting inspiring events around the U.S. and through our Tony Blankley fellowship." The late Tony Blankley, along with his wife, Lynda Davis, was an early and invaluable supporter of the Steamboat Institute. The Tea Party movement was just getting off the ground when the Steamboat Institute was founded. Seizing this momentum, the Steamboat Institute held its first official event--a Taxpayer Rally--on April 15, on the Routt County Courthouse lawn in downtown Steamboat Springs. An enthusiastic crowd of 300 people showed up, and the rally was featured on Denver's NBC affiliate. "People were fired up. Conservatives had the chance to come out and show their support for American exceptionalism and limited government," Schubert-Akin recalls. "After the rally, people said, 'What are you going to do next? What is this Steamboat Institute? What are you going to do?' So we boldly announced that we were going to put on an event called the Freedom Conference and that we were going to invite the brightest conservative minds from around the country." They had to work fast. It was April and they had vowed to hold the Freedom Conference in August. The Steamboat Institute didn't even have a bank account yet. "Would you believe that?," Jennifer says. "The organization existed as a legal entity, but we had not done anything yet. We were all busy running our full-time careers. And so, I said, 'Okay, now we're on the line because we publicly stated that we're going to hold this event, so we’d better pull it off.' "Jennifer and Rick flew to Washington, D.C., to seek advice from conservative movement leaders such as Ed Feulner and Bridgett Wagner of the Heritage Foundation. Wagner is now on the board of the Steamboat Institute. With advice and encouragement from pros (including Blankley), the institute held its first Freedom Conference, as promised, in August. Speakers included conservative stars, such as Michael Reagan, economics writer Stephen Moore, Grover Norquist of Americans for Tax Reform, and then-Congresswoman Michele Bachmann from Minnesota. They had to work fast. It was April and they had vowed to hold the first Freedom Conference in August. The Steamboat Institute didn't even have a bank account yet. "Would you believe that?," Jennifer says. "The organization existed as a legal entity, but we had not done anything yet. We were all busy running our full-time careers." "Everything we do," Schubert-Akin says, "is based on five principles, and they're very simply this: Limited taxation and fiscal responsibility is one; limited government; individual rights and responsibilities; free market capitalism and strong national defense. So, we stay focused on educating people on those five principles and then inspiring people after they've learned more about these principles to get involved. Whether it's on their campus (if they are a student), in their community, it could be running for office, which many people have done as a result of what they’ve learned through The Steamboat Institute. Or maybe it's something as simple as being brave enough to write a letter to the editor." A particular goal of the Steamboat Institute is training the next generation of conservative leaders. Schubert-Akin has written about the "culture of coddling," that now prevails in America, where people feel they must be protected from ideas they might not find congenial. She wrote that this culture "reached its apex on the country’s college campuses, where safe spaces, trigger warnings and free speech zones shelter the next generation from the challenges they will inevitably face." The Steamboat Institute's Campus Liberty Tour seeks to present an alternative. The current tour asks the question, "Are American college campuses free speech zones?" The Steamboat Institute sends to campuses such A-list speakers as Alan Dershowitz, Emeritus Professor of Law at Harvard University; Amy Wax, the University of Pennsylvania Law School professor who made headlines by asserting that bourgeois norms have value; and Judge Janice Rogers Brown, formerly of the U.S. Court of Appeals, District of Columbia. Randian Yaron Brook is scheduled to debate capitalism versus socialism on the campus tour later this Spring. Also promoting intellectual inquiry among young conservatives, the Tony Blankley Fellowship honors Blankley's legacy by "nurturing and supporting the careers of outstanding young journalists and emerging conservative thought leaders who share the principles and values espoused by the late Tony Blankley and The Steamboat Institute." It comes with a $10,000 stipend, speaking opportunities, travel opportunities, robust social media support, and extensive networking opportunities. Philip Wegmann, a young commentary writer at the Washington Examiner, is the 2018-2019 Tony Blankley Fellow. Other Blankley Fellows include IWF policy director Hadley Heath Manning, Kelsey Harkness, news producer at the Daily Signal (and an IWF fellow), political journalist Tom Rogan, and Wall Street Journal opinion writer Jillian Melchior (a former IWF fellow). It is noted that quite a few of the Blankley Fellows are young women. "You know," Schubert-Akin replies, "we always pick the best person, whether it’s the best speaker or our Blankley Fellows. We always try to make our decisions based on merit. Who is the master of this particular topic we want to present? Many of them have been young women. And, yes, I am totally in favor of providing as much opportunity as I can to young women. But I’m also equally in favor of providing the best opportunity we can to young men. When you look at our Emerging Leaders Council, it’s a great mix of young men and women, students who show such potential." One of the latest additions to the Steamboat Institute's offerings is a film festival. "There are more conservative films out there than you would realize because many of them aren't as well-funded and don't get as much attention, but are great quality films," says Schubert-Akin. One of the latest additions to the Steamboat Institute's offerings is a film festival. It is run in conjunction with the Freedom Conference. Think of it as an aspiring Sundance Festival for conservative filmmakers. Last year's movies were "Chappaquiddick," "Atlas Shrugged," "Little Pink House," "What If?" and "Life with Dog." "Chappaquiddick" co-producer Chris Fenton spoke, as did Susette Kelo, whose house was taken from her for public use, leading to the famous Kelo case on eminent domain. But are there enough conservative films to justify a festival? "There are more conservative films out there than you would realize because many of them aren't as well-funded and don't get as much attention, but are great quality films," says Schubert-Akin. "Chappaquiddick," she points out, featured several co-producers who self-identify as Democrats or left-leaning. The Steamboat Institute is not as large or well-established as the Aspen Institute. Yet. When you have somebody as dedicated, hard-working, and relentless as Jennifer Schubert-Akin running the show, you never can tell.